Jennifer here once again. Hope you are all well and feeling happy. Today's card was made in February of last year for Sue and Harvey of Imagination Crafts. Make a white base card. 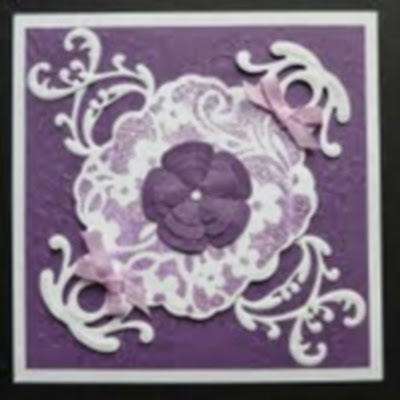 Take a piece of purple paper and put it through an embossing machine along with the stencil and emboss it. Matt this onto the base card, leaving a small border of white card showing. Using the tag die and the Grand Calibur machine, cut out the large tag. Leaving the die on the tag, lay the stencil on it and spread the sparkle medium over it. Remove stencil and the die carefully and leave the tag to dry. Fix the tag diagonally across the base card using sticky foam pads. Add two bows to the tag. Die cut four corners and glue two corners together and glue to the side edge of the tag. Repeat again with the other two corners and glue to the other side of the tag. Cut out the flower using the Marianne Design die and glue to the centre of the tag. Punch out a tiny white circle and glue to the flower centre. Well that is it finished, quite a quick card to make if you don't have a lot of time. One little tip I should mention, after you have removed the die from the tag, having spread the sparkle medium over it, the die should be washed straight away or the sparkle medium may set on the die and it won't cut properly next time you use it !! I'll be back soon with another card, hope you will too !! until then have a good week. Hope everyone is well and enjoying life. 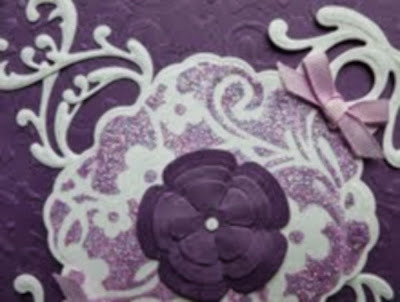 Today I am going to share a card I made for Sue and Harvey of Imagination Crafts in April this year. It was a little bit tricky to cut out the shapes on the background and still keep the stencil design perfect but I think I managed that, I do hope you think so lolls !!. Here's how I made it. I made a base card from blue cardstock and onto that I matted a piece of terracotta coloured card leaving a border of the blue showing. I then took a piece of Imagination Craft's lemon satin card and trimmed it slightly smaller than the terracotta card. 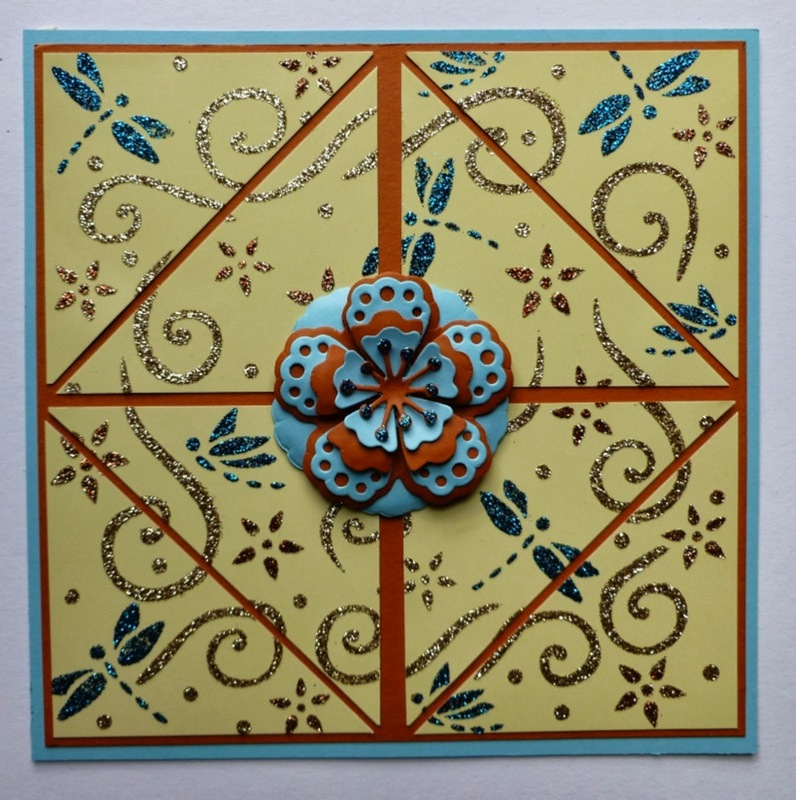 The stencil was laid on top of the lemon card and the Sparkle Mediums were spread over it, making the dragonflies- Blue Moonstone, the flowers - Amber and the rest of the stencil with the Mink Sparkle Medium. I then left it to dry. It doesn't take very long but to be sure leave it for about forty five minutes. I tend to go downstairs and make a cup of tea or do a small job and when I've done that it is usually dry. 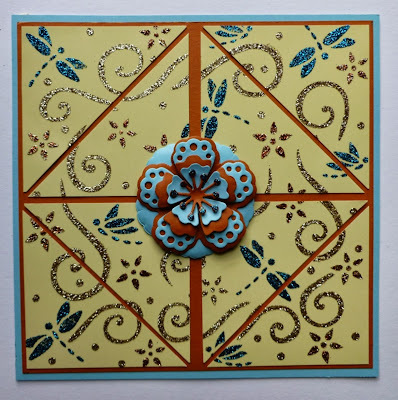 Cut the lemon card into triangles and glue to the terracotta card, leaving tiny gaps between the pieces of card. 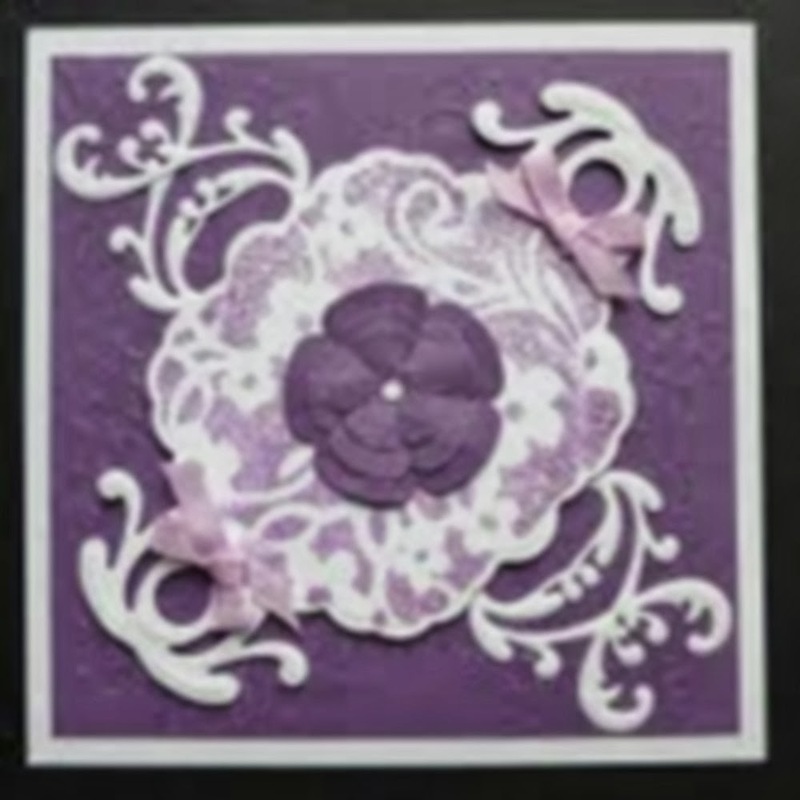 Cut out and emboss a flower using the flower die and the Grand Calibur from the blue and the terracotta card and glue to the card centre. Add Blue Moonstone Sparkle Medium to the tips of the stamen. That is that friends, hope you like it. I do hope you have all had a good week and are looking forward to the weekend. Let's hope the weather forcaster's are right and we will see a change for the better in the weather this weekend lolls. It has been so dull and dreary in our neck of the woods. A little sunshine would make such a difference ! I would just like to say thank you to those of you who are following me, I really appreciate this and I value your opinions on my creations. I will try and reciprocate by visiting your blogs too. Well onto today's card. I love this stamp as the leaves are so realistic. 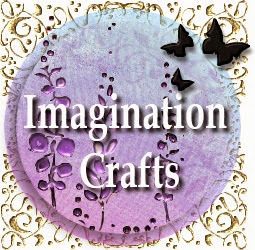 This card was made for Imagination Crafts in March this year. Onto a blue base card matt a white card which has been cut using a Spellbinder's label die. Stamp all around the edges of the label using the swirl die from the leaf set, using a blue distress ink. 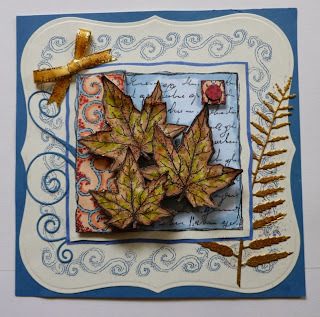 Using a black ink pad, stamp the main leaf image onto some white card and colour with Promarker Pens. Repeat this a further five times. Colour, cut out and 3D onto the main image. Matt this onto some white card and then onto some blue card. Die cut a fern from gold card and glue to the right hand side of the large stamped label. Next glue the leaf image to the centre of the large label and glue the label to the base card. Cut out the swirl from blue card using a die cutting machine and the Memory Box die and glue to the left side of the main image. Glue a gold ribbon to the top left of the card and add some sparkle medium to the bow and to the leaves. Rub a little over the fern too. Well that's it finished I do hope you like it, I feel quite pleased with the end results. Take care of yourselves until I blog again. The crafting show season is upon us and this coming weekend we are at two shows. One up north and the other down South. Harvey and some of the team will be at the Happy Stampers show in Port Sunlight on Saturday which is a one day show and is a pre-sold tickets show only. There will be demonstrations on the stand. Sue will be at the ICHF Hobbycrafts show from Thursday 26 September until Sunday 29th September. Sue will be demonstrating on the stand. Crafty friends, the good news is that if you print off this page and bring it with you to either of the shows above and hand this in with any purchases you will receive 10% discount! Valid from Thursday to Sunday 5.00 pm for Westpoint Exeter.